This Honda Civic is available in Silver, Black, White, Red, Blue other colours and lease options, subject to availability and includes a warranty. The Honda including 1.4-litre, 1.8-litre and a couple of 2.2-litre petrol units: normal, and manic 197bhp Type-R. All petrol engines feature VTEC variable valve timing and all are very good indeed; that Type-R is truly magical. There's also a 1.7-litre diesel, developed in association with Isuzu, and, for the eco-aware, the hybrid petrol-electric Civic IMA. Available as a three or five-door hatch, or four-door saloon. Which Honda Civic are you going to lease today? We offer top quality Honda Civic from brand new, nearly new, slightly used or ex demo, whether you have good or poor credit rating, pay a low or no deposit. These Honda Civic can be leased or financed and come with a warranty, HPI checked and when contract hire leasing, include UK nationwide delivery and AA or RAC Roadside Assistance cover for peace of mind. 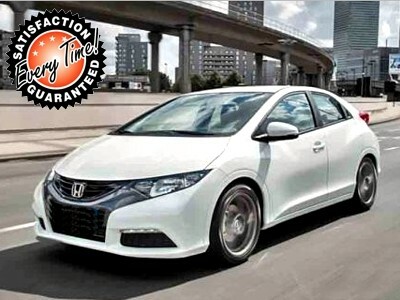 Time4Leasing can offer you the latest Honda Civic lease deals at lower prices because these vehicles are exclusive and offered at lower rates to customers that have good, poor or even bad credit history score ratings. The 2.2-litre diesel is the trickiest engine to recommend, being both unrefined and pricey. However, the 1.6-litre diesel boosts the Civic’s appeal thanks to strong performance and very low emissions, which make it exempt from VED tax and the London Congestion Charge. It’s also more refined and has a more compliant ride. Four trims are available, with T grades in between that add sat-nav, but we don’t see any point in going beyond the second rung on the ladder – ES – because this gives you climate control, a USB socket, cruise control, Bluetooth and a reversing camera. Avoid the stingy entry-level SE trim. All Civics come with a three-year/90,000-mile warranty, while a six-year unlimited mileage warranty is available as a cost option. There are 39 Honda Civic Lease Deals on Offer.